I have a confession to make: I am a zombie! Since James hit the 4 month wakeful period (combined with teething, immunisations and general grizzle), he’s gone from being a great napper and sleeping through the night, to only cat-napping after a good half an hour to an hour of inconsolable crying. If that wasn’t enough, he’s also gone back to waking a couple of times in the night for feeds. Does any of that sound familiar to all you parents out there? Needless to say that I’ve been open to try anything that helps James (and I) get more sleep, so when I heard of the Slumbersac sleep bags, I thought it was at least worth trying. James has never used a sleeping bag before, so I was curious as to how he would feel because he generally hates being confined or constricted in any way – he’s such a wriggler! The idea behind putting your baby to sleep in a sleeping bag is that babies tend to get a better night sleep at a constant temperature. 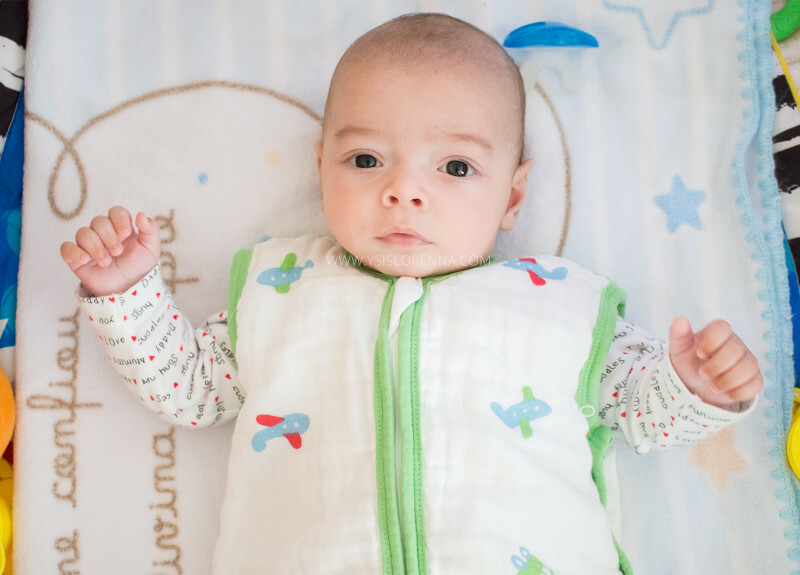 Our little ones can easily wriggle out of a conventional blanket if they are too hot, but they can’t put it back over themselves if, later on, they get a bit chilly, so using a sleeping bag will ensure your baby will stay snug all night, and they’re more likely to settle back to sleep if they feel comfortable. As I said before, James is a total wriggler! I’ve lost count of how many times he has pulled his blanket over his face and woke himself up all flustered because he was suddenly uncomfortable and didn’t know why. Luckily, nothing worrying has ever happened (touch wood! ); we use a baby monitor during naps and bedtime to keep an eye on him, but even so, it’s not easy running up the stairs to gently sort him out without waking him too much. Slumbersac offers a wide variety of sleeping bags to suit all seasons, sizes and situations. I have the Baby Muslin Sleeping Bag for Boys in 0-6 months and it’s unpadded, 0.5 tog light weight, which is ideal for Summer or if your house tends to warm up easily like mine. This sleeping bag is also available in 6-18 months, 12-36 months, 3-6 years and in the standard padded 2.0-2.5 tog, which is more suitable for wearing during the colder months. We’ve been trying out the Slumbersac for just over a month and not only is it super cute, but I really like it. If it’s chilly or not so warm in the night (18-23 C), I dress James in a sleeveless bodysuit, a sleepsuit and the Slumbersac. If it’s a relatively warm night (23 C +), I skip the bodysuit and put James to sleep in a sleepsuit and the Slumbersac sleeping bag. The size is great – spacious enough so James has plenty of room to still feel free to wriggle, and the poppers under the arms help to better fit slender babies. 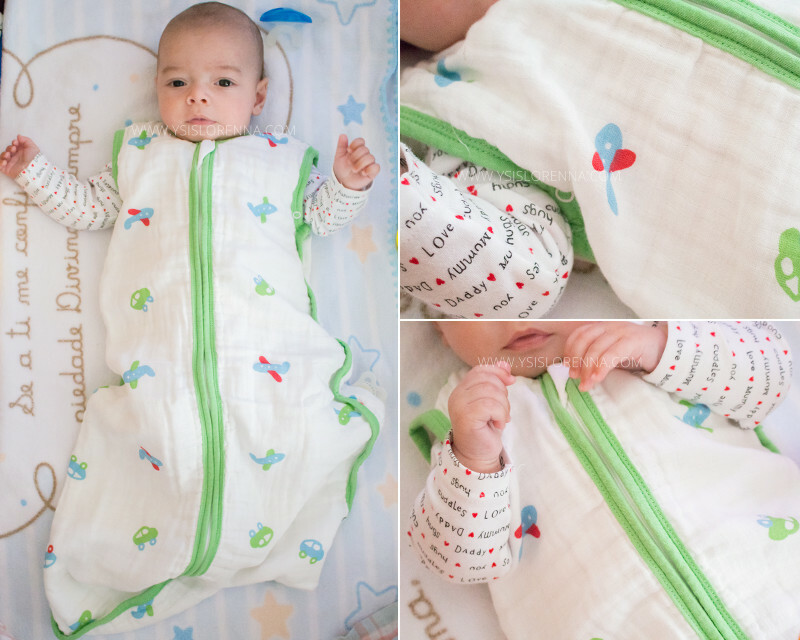 The Muslin Sleeping Bag is really soft and lightweight, which makes it easy to layer up or down to keep your baby at a comfortable temperature at night. The bag zips up to the chest, but there’s a piece of fabric to tuck in the zipper, which is great to prevent your baby from grabbing or being scratched by it. During our trial period, I made the process of getting into the sleeping bag part of James’ bedtime routine (bath – cuddles – sleeping bag – milk – lullabies – bed), so he knew to expect his milk after he was tucked up in the bag. I think James enjoys being cosy in the Slumbersac without feeling too warm because of the lightweight muslin material and it being sleeveless. Unfortunately, the Slumbersac has not been the magical cure to James’ lack of sleep. Granted, it has helped my wriggly boy not wake in the night because he was too cold or wanting to be tucked in again, but we’re still not back to sleeping through the night, and he’s still waking for feeds, cuddles or a dummy. Fingers crossed now that he’s 5 months old, the 4-month-sleep-regression is on its way out! I still use the Slumbersac, but not consistently as it needs to be washed every other day to clean up all the dribble from a teething baby. I also skip it if he’s zonked out before I get the chance to put him in it or if we’re travelling. I definitely think it’s worth trying to put your baby in a sleeping bag if he or she is struggling to sleep, and Slumbersac offers a great range of sleeping bags at an affordable price. Maybe after James is finished with all the teething struggles and is feeling more settled, I’ll try to make the sleeping bag part of his bedtime routine again to see if we can both finally enjoy a good peaceful night’s sleep. One can only hope! What are your thoughts on a sleeping bag for babies? Have you tried it before? Has it helped your baby sleep better? If you want to know more about Slumbersac and their range of sleeping bags, check out their website here. I really like the idea of the travel sleeping bag and the sleeping bag with feet for when James is a bit older!